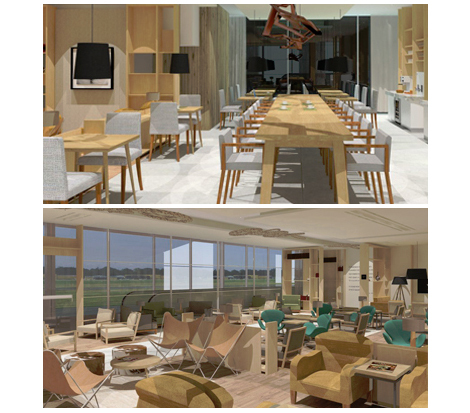 Star Alliance has opened a new lounge at Buenos Aires Ministro Pistarini International Airport (also known as Ezeiza International airport), with facilities including showers, free wifi, and hot and cold snacks. The group’s website confirms that the new facility “is available to guests from December 2012”, and is located airside on the second floor of Terminal B. Features include seating for over 130 guests, free wifi and local phone calls, showers, a business centre, TVs offering news and sports channels, hot and cold snacks and soft / alcoholic drinks, and a range of newspapers and magazines. Open 24/7, the lounge was designed by local architects Estudio Roitman, “to reflect the tranquillity of the countryside typical in Argentina”, and fixtures and fittings have been sourced using local materials and artwork where possible. Star Alliance says the lounge “is the first of the next generation of Star Alliance Lounges to carry locally inspired designs along with the comforts you would expect from an international lounge”. The group currently has four other Star Alliance-branded lounges at London Heathrow Terminal 1, Los Angeles Tom Bradley International Terminal, Nagoya International airport and Paris CDG Terminal 1. For more information visit staralliance.com.